Mary F. (Zappala) Paiva, 85, of Boxford, MA passed away on Wednesday, November 14, 2018 at Atria Merrimack Place in Newburyport. Born in Melrose on March 15, 1933, she was the daughter of the late Salvatore and Anne Mary (McLaughlin) Zappala of Wakefield. She was also the stepdaughter of the late Gloria Zappala. Raised in Wakefield, she was a graduate of Wakefield High School, Class of 1951. Upon graduation, Mary worked for New England Telephone Company as a switchboard operator. She married her high school sweetheart, Robert C. Paiva, and they made their home in Wakefield, where they raised two children, daughter Nancy and son Brian. Mary's most important role in life was as a devoted and loving wife, mother, daughter, sister, granddaughter, niece and grandmother. Following the tragic loss of her husband in 1978, Mary joined her brothers John and Billy at "The Ship" restaurant in Lynnfield, where she welcomed patrons at the front door. This was a role that suited her perfectly, given her outgoing and very sweet disposition, style, grace, and professionalism. At "The Ship," Mary reconnected with many old friends from Wakefield who frequented the restaurant. Subsequently, she and Alfred "Fred" Yebba began dating and would spend the next 25 years together as loving companions. They traveled extensively, but their greatest joy was found in ballroom dancing. They formed lasting friendships with other dance couples, as the group followed their favorite band to venues near and far. Mary and Fred both were accomplished cooks with a passion for Italian food. Mary's home on Vale View Road was the setting for countless feasts enjoyed by family and friends spanning many years. Lots of laughs, good times, and precious memories were made and shared at Mary's house. Most recently, Mary made her home with daughter Nancy and son-in-law Ron Torlone in Boxford before moving to Atria Merrimack Place Assisted Living. True to form, Mary settled right in and quickly became the life of the party, participating in all the activities and bus trips. The family extends its heartfelt appreciation to the entire team at Atria for their compassionate care and support over the last two years. Mary is survived by her daughter Nancy Anne and husband Ronald Torlone of Boxford. She was the mother of the late Brian E. Paiva of Wakefield. 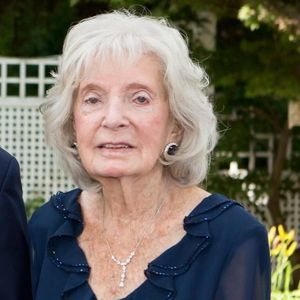 She is also survived by three sisters: Susan Zappala of Rowley, Marianne Zappala of Methuen and Lisa Zappala of Derry, NH and two brothers: Robert Zappala of Billerica and Thomas Zappala of Naples, FL. Mary leaves grandchildren: Robert Torlone and wife Sage, Christina Torlone, and Kristen (Paiva) Reed and husband David, as well as 3 great grandchildren and many nieces and nephews. Mary was predeceased by brothers: James, John, William and Paul Zappala and stepbrothers: Dennis and John Flynn. Her Funeral Service will be held in the McDonald Funeral Home, 19 Yale Ave., Wakefield on Wednesday at 11am. Visitation for relatives and friends will be held prior to the service beginning at 9am. Interment to follow at Forest Glade Cemetery in Wakefield.